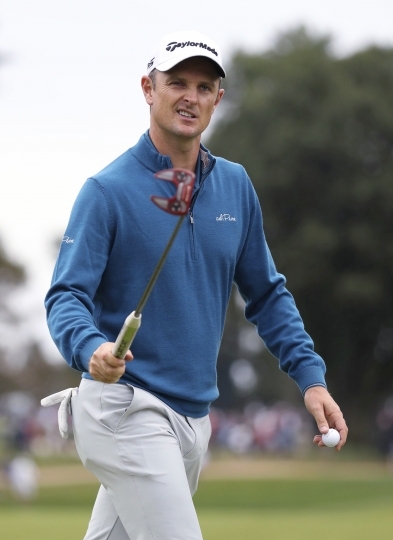 NEWTOWN SQUARE, Pa. — Justin Rose has to wait until Monday to have a shot at getting to No. 1 in the world. And he still might not have to hit another shot at the BMW Championship. CRANS-MONTANA, Switzerland — Matthew Fitzpatrick made a 12-foot birdie putt on the first extra hole to become the first back-to-back European Masters winner since Seve Ballesteros 40 years ago. Fitzpatrick forced a playoff with Lucas Bjerregaard by making a shorter birdie putt on the same 18th green 20 earlier for a 3-under 67. Bjerregaard closed with a 63 for the lowest round of the week at Crans-sur-Sierre in the Swiss Alps. They finished at 17-under 263. Thankyakon Khronogpha of Thailand won the ISPS Handa Match Play with a 2-and-1 victory over Shugo Imahira on the Japan Golf Tour. ... Tom Lewis of England opened with a 63 and closed with a 64 in winning the Bridgestone Challenge by five shots over Sebastian Soderberg and Dimitrios Papadatos on the European Challenge Tour. ... Blake Olson won the Mackenzie Investments Open in Montreal for his first Mackenzie Tour title. He beat fellow American Corey Pereira with a par on the first hole of a playoff. ... Nick Voke of New Zealand closed with a 6-under 66 and birdied the second playoff hole against Stephen Lewton of England to win the Qinhuangdo Championship on the PGA Tour Series-China. Lewton shot 68 in the final round. Charlie Saxon, the 54-hole lead, shot 71 to finish third and stay atop the money list. ... Magnus Atlevi closed with a 4-under 67 for a three-shot victory over Stephen Dodd in the European Tour Properties Senior Classic in Bulgaria. Caroline Hedwall of Sweden rallied from seven shots behind with a 9-under 62 for a two-shot victory over Stacy Lee Bregman of South Africa in the Ladies French Open. ... Former world No. 1 Jiyai Shin won for the second straight week on the Japan LPGA Tour, closing with a 4-under 68 for a nine-shot victory in the Japan LPGA Championship Konica Minolta Cup. It was her third victory this season. ... Seul-gi Jeong closed with a 70 for a one-shot victory in the KG-Edaily Ladies Open on the Korean LPGA Tour. ... Allyssa Ferrell won the Garden City Charity Classic in Kansas for her first Symertra Tour title. She closed with a 5-under 67 for a two-stroke victory over Madison Pressel, Pavarisa Yoktuan and Dana Finkelstein.